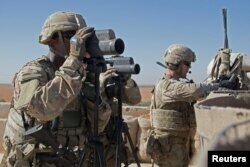 FILE - Photo released by the U.S. Army shows U.S. soldiers gathering for a brief during a combined joint patrol rehearsal in Manbij, Syria, Nov. 7, 2018. Syrian Kurdish allies of the United States are worried about President Donald Trump’s decision to withdraw all U.S. military forces from Syria. U.S. lawmakers reacted with surprise to the president’s decision to immediately begin withdrawing all U.S. troops in Syria. South Carolina Senator Lindsey Graham said the decision was a “disaster in the making." Graham belongs to the Republican Party and is usually a Trump supporter. Earlier this week, Turkish President Recep Tayyip Erdogan said he had won “concessions” during a long telephone call with Trump. Erdogan said they talked about a Turkish offensive against the Kurds. Some Middle East experts have strongly criticized the president’s decision. Charles Lister at Washington’s Middle East Institute called the move a “dream scenario” for IS, Russia, Iran and Syrian President Bashar al-Assad. Richard Haas is president of the Council on Foreign Relations. He said it is “morally wrong” to leave the Syrian Kurds to face Turkey alone.